Ian Ross has been researching and writing about the later Roman world and its army for over a decade. He spent a year in Italy teaching English, but now lives in Bath. Centurion Aurelius Castus – once a soldier in the elite legions of the Danube – believes his glory days are over, as he finds himself in the cold, grey wastes of northern Britain, battling to protect an empire in decline. When the king of the Picts dies in mysterious circumstances, Castus is selected to guard the Roman envoy sent to negotiate with the barbarians beyond Hadrian’s Wall. Here he will face the supreme challenge of command, in a mission riven with bloodshed and treachery, that tests his honour to the limit. As he struggles to avert disaster and keep his promise to a woman he has sworn to protect, Castus discovers that nothing about this doomed enterprise was ever what it seemed. 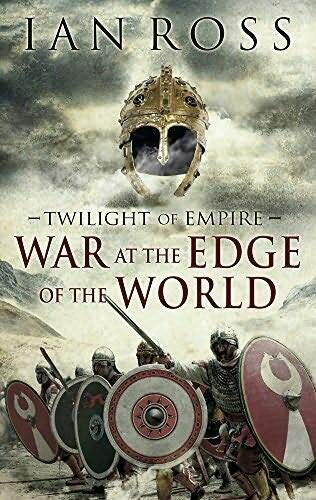 Ian Ross and Twilight of Empire: War at the edge of the World has all the hallmarks of the next great Roman series. The author has chosen a period that few have written in, a time when Rome and its empire is very different to the one we see portrayed in films and the HBO TV series, gone is the segmented armour, the Scutum etc, in its place, Mail or scale armour oval shields and these guys wore tunics and breeches, a clear sign of the blending of other nations into the empire . It was a time when the Empire was so large its power and leadership was shared, its politics even murkier. The book follows the exploits of Centurion Aurelius Castus, his journey north into the lands of the Picts, the inevitable betrayals, escape and eventual revenge. The book is delivered in an interesting style, i would suspect that the author is very well read in the genre, or by some quirk of writing styles he has endeavored to produce the depth of detail and narrative of Ben Kane, the action and pace of SJA Turney and a main character that has the depth and personality of Simon Scarrows Macro (that’s not an Insult, i think Macro is very multi faceted). Castus is a non nonsense hard fighting centurion, a man who looks out for his men, he is also a man with a tactical brain, very much like Macro. Add in Nigrinus the notary (who takes the place of Narcissus) and you can see the comparison… but don’t be swayed by it, this is only a facet of the characters and plot, Ian Ross brings plenty of originality. The Journey of Centurion Aurelius Castus is a refreshing change for the Roman fiction genre, across a very much changed Romano Britain landscape, the power of the empire has dimmed at its edges, but thinking its failed is a mistake the Picts will rue. In the same way that the conquest of Britain was for politician ends rather than expansion, this political backwater of the empire is once again at the forefront of a changing an empire, Instead of Claudius solidifying his hold on power, we are to witness the rise of Constantine, a name to shape an empire. In many ways this book feels like a taste of what’s to come from a clearly talented author. I hope to follow more of the journeys and battles of Centurion Aurelius Castus, and also the rise of Constantine. Hi Rod, thank you. that really does make my day. Its always nice to know that someone appreciates the same great books.